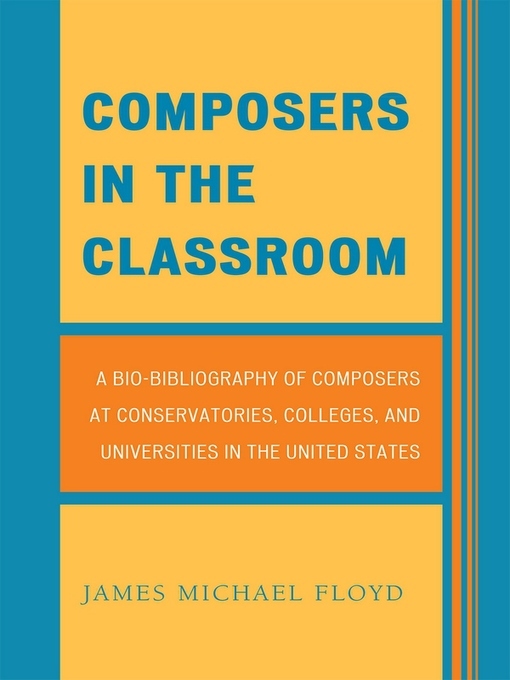 Composers in the Classroom is a bio-bibliographical dictionary, chronicling the careers and work of over 120 composers associated with conservatories, colleges, and universities in the United States and Puerto Rico. Scholars and students of music seeking critical information about composers who have taken on the mantle of instruction will find a wealth of detail on their subjects. Painstakingly obtained through direct correspondence with the composers themselves, Floyd includes within each entry a short biography of the composer's life and education, lists of previous positions, most prominent commissions, awards and honors, and notable performers of the subject's work. Each entry also contains a discography of the recordings and a bibliography of writings by the composer. Researchers will find especially useful the organization of each subject's compositions by a variety of types. These include vocal, choral/assembly, dramatic, keyboard, solo instrument, handbells, chamber music, jazz ensemble, band and wind ensemble, band and wind ensemble with solo instruments, orchestra, orchestra with solo instruments, film/television/commercial, electro-acoustic and multimedia, arrangements, transcriptions, and editions and reconstructions. Music scholars will find under each work not only the title and date of composition but also the date of revision, commission, and dedication information, as well as other pertinent details ranging from the names of collaborators to alternate titles under which works may circulate. Composers in the Classroom is an indispensable tool to scholars of modern music seeking to research the current state of musical composition and the compositional trends of the 21st century.